The Blue Grass Commercial Club was originally formed on June 17, 1946 by a group of Blue Grass businessmen to participate in homecoming celebrations for the returning WWII Veterans. These homecoming traditions are still provided by the Blue Grass Community Club the first full weekend in June. Blue Grass Homecoming Days also known simply as Blue Grass Days, remains a fun-filled weekend fundraiser for the community. It includes a variety of activities such as: carnival rides, royalty contests, live music and entertainment, food, libations, crafts, area fire department water fights, an awesome firework display at dusk on Saturday (weather permitting) and a themed parade on Sunday afternoon. The Community Recreation, Inc. was founded in 1949 to finance the erection of a new Community Hall which had previously burned down. On February 1, 1949, land was purchased from Hubert A. Freund for the sum of $1,000 to form a Blue Grass Park. On July 12, 1949, a 140’ x 70’ plot was donated and deeded to the Community Recreations, Inc. In November 1951, a building was erected on this plot. As time went on, caring for the hall became too much of a burden, and the hall was purchased by The Blue Grass Commercial Club in 1978. The original officers of the Blue Grass Commercial Club were Fred Kautz, Don Farley, Ellerd Tangen and Harold Moore. The Blue Grass Community Club (changed from the Blue Grass Commercial Club in 1982) is a privately owned, non-profit organization and has no business affiliations. In 2003, The Blue Grass Community Club began allowing women to join the club. Member business meetings are held on the second Tuesday of each month at 7:00 pm with a social and dinner hour proceeding at 6:00 pm. The Blue Grass Community Club invites all Blue Grass residents and residents of nearby communities to join with a yearly membership of only $12.00. The Blue Grass Community Club elects board members and officers each year. They are tasked with governing and managing the clubs day to day activities along with making decisions that shape the clubs future. The Blue Grass Community Club has six voting board members, along with four non-voting officers with the President voting solely as a tie-breaker. The Blue Grass Community Club offers many amenities including a large, air-conditioned hall suitable for receptions, parties, meetings, reunions, prom events, fundraisers, conferences, seminars, showers, specialty/industry shows, etc. Our outside amenities include a park with a children’s playground, basketball court, large and small picnic pavilion(s) and a lighted ball diamond with concession stand. 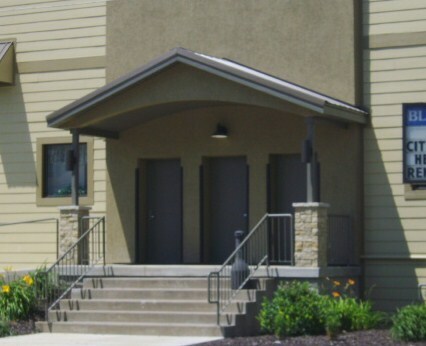 All of these amenities are maintained by the Blue Grass Community Club. In 2004, the Blue Grass Community Club introduced trivia to the local and out-lying communities. Due to its success, the Community Club has been able to make several improvements to the venue as well as donate funds to several organizations throughout the year. These organizations include many school functions, the Blue Grass Fire Department, U. S. Military as well as needy children during the holidays. It is our hope to continue funding these projects and improve the community to the best of our efforts. Together, we can all make a change. Please call the Blue Grass Community Club today to see how you can make a difference.